ARLINGTON, VA - June 21, 2018 - Hobsons, the education technology leader and the company behind Naviance, is pleased to announce that Naviance has helped school districts across the country improve college and career readiness outcomes for more than 11 million students by building the mindsets and toolsets for student success. Throughout the 2017-18 school year, Naviance has assisted 1.6 million high school seniors find their best fit college or career path after high school. 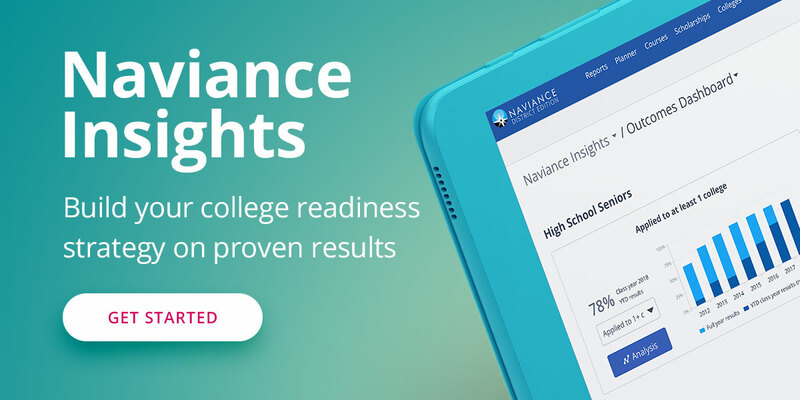 Naviance by Hobsons is the college and career readiness platform of choice for more than 40% of high schools nationwide, and helps more than 13,000 K-12 schools and districts align student strengths and interests to postsecondary goals. This year alone, students explored college profiles within Naviance more than 100 million times in support of identifying colleges they were interested in applying to. As a result, Naviance students submitted a total of 6.4 million applications to 2- and 4-year higher education institutions this school year. In addition, schools submitted 38 million documents to higher education institutions through Naviance in support of the college application process. The total number of college applications sent by Naviance students has increased by 8%, with a 2% increase in college acceptances since the 2016-17 school year. Naviance provides students with information and resources to make informed decisions about college and career options after high school. Through strengths and interests surveys, students are able to better determine which careers are a best fit for their future. Throughout the 2017-18 school year, the self-discovery assessments provided within Naviance had more than 10 million page views across students in middle and high school. Students also viewed career exploration and research pages within Naviance 76 million times. Students accessed the career specific assessments more than 15 million times throughout this school year. These assessments help students determine the careers that best match with their interests. In 2017, Naviance was identified as a key factor in improving student success outcomes in an independent report published in the Journal of College Access. The study found that students who log into Naviance more frequently, and therefore utilize the resources (such as college search, and career and self-assessments) within Naviance, are more likely to apply to post-secondary options like 2- and 4-year colleges.